Reading 'The photograph as contemporary art - Charlotte Cotton' was at first rather hard going..... after perseverance though it become a really intriguing read with some wonderful images, such as Yang Yong Fancy in a Tunnel 2003. I just love the pose here, the almost through away gesture , the cloths, location and even the person in the background. I also wonder what, if anything she is firing at? 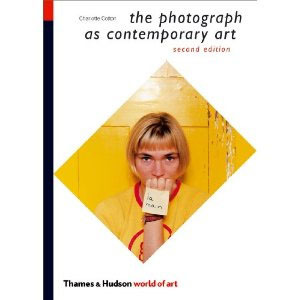 Finally, I was engrossed when Cotton described peoples' perception of themselves in images. Typically in not wanting to accept what the image reveals. Age is probably one of the reasons for this as well as self perceived looks. This will have left many images thrown away or destroyed. It was interesting to see the work of Joachim Schmid, who has taken these discarded photographs and reused them in his own work. In it they describe a moment in time that was captured which clearly the owner didn't want revealed. The following example from the book shows a young lady asleep, perhaps past out drunk, the background doesn't suggest she is in a bed and the fact that she only has her underwear may even suggest that she didn't quite make it to bed in an almost splayed out position. So not surprising when someone took this unflattering image it was discarded and torn in four. Revived though it describes or suggests that moment in time of that particular person ad invokes plenty of thought.